You read that right – similar to carrot cakes, Healthy Bakers’ collection of dry cakes and muffins are loaded with good-for-you veggies like spinach or zucchini. And, if Gurgaon’s foodies are to be believed, they taste amazing. Fashion designer, Sonica Singh’s daughter was a fussy eater so this Gurgaon-based fashion designer spent a large part of her day trying to come up with innovative, yet healthy recipes. She struck gold when she found that her daughter loved her veggie cakes – made with 100% wholewheat, no butter or sugar. 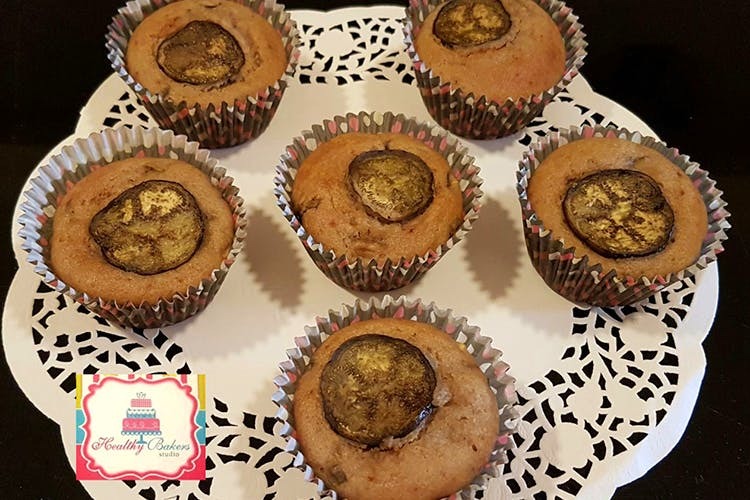 Ingredients like zucchini, spinach, aubergine, beans, dates or carrots are cleverly hidden into cake loaves and muffins, and Gurgaon’s mummies pick them up weekly. A set of six muffins is for INR 200. If you’re an old-school dessert-lover, Sonica also does designer cakes and cupcakes for every occasion. Harry Potter or Spiderman, her themed fondant cakes are a big hit at birthday parties. In fact, she’s won a few awards for her baked goodies – they’re that good! Whether you’re trying to boost your child’s vegetable intake or are looking for a home-baker for an anniversary, Healthy Bakers has just the cake for you.